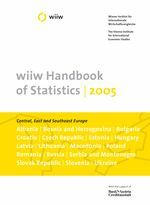 The wiiw Handbook of statistics is published annually and contains each year revised, updated and expanded annual and monthly statistics on the transition economies. It covers key economic data on the following countries: Albania, Bosnia and Herzegovina, Bulgaria, Croatia, the Czech Republic, Estonia, Hungary, Latvia, Lithuania, Macedonia, Poland, Romania, Russia, Serbia and Montenegro, the Slovak Republic, Slovenia and Ukraine. The 2005 edition covers the period 1990 to September 2005.